Description A Gantt chart or project schedule includes a list of tasks on the left and horizontal bars on the right showing when the tasks begin and end. In this Gantt chart, the smallest increment is one week. You can also draw charts with one hour, day, or month being the smallest incremental value. Gantt charts show task and schedule information. A Gantt chart is a management tool and a communications tool. Color or shading is sometimes used to show how much of each task has been completed. 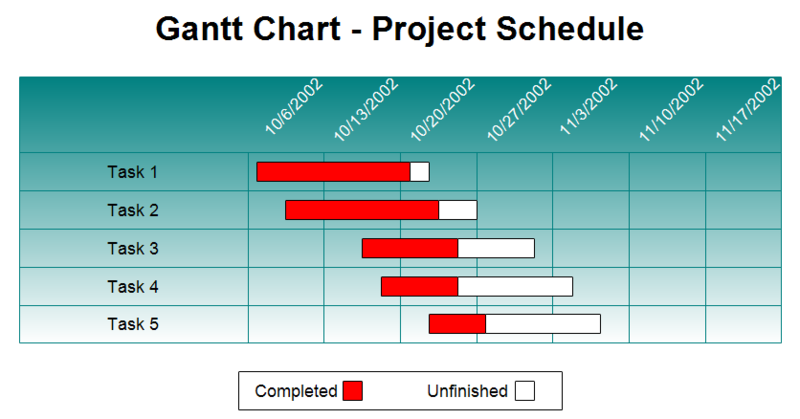 In the Gantt chart shown above the red portion shows how much of that task is completed. Once RFFlow is installed, you can open the above chart in RFFlow by clicking on gantt2.flo. From there you can zoom in, edit, and print this sample Gantt chart. It is often easier to modify an existing chart than to draw it from scratch.